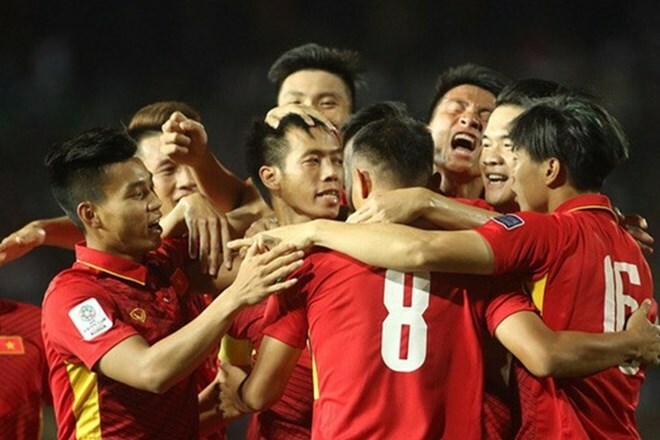 Hanoi (VNA) – Players of the Vietnamese national football team kept their promise by turning their promise by turning their latest 2019 Asian Cup qualifying match into a farewell for their acting head coach Mai Duc Chung. The team defeated Cambodia 5-0 in their Group C match, which saw them stay in second place in the group on eight points while the group leader, Jordan, tied 3-3 with Afghanistan in the same round of matches. Chung will leave the team after the two matches that he was assigned to manage, after former coach Nguyen Huu Thang resigned in August following the failure of Vietnam’s U22 squad at the Southeast Asian Games in Malaysia. The team will welcome their new coach Park Hang-seo from the Republic of Korea, who will sign a contract with the Vietnam Football Federation in Hanoi on October 11. Park was also watching in the stands during October 10’s match. Dinh Thanh Trung opened the scoring for Vietnam just 13 minutes after the first whistle. Trung received a pass from his teammate near the box and his shot deflected off a Cambodain defender’s leg into the net, as Cambodia’s goalkeeper Sou Yaty failed to react under the heavy rain. Trung nearly scored his double two minutes later, after he shot a volley to the right side of the post, but it went a little wide. Chung’s strikers, Nguyen Cong Phuong and Nguyen Anh Duc, as well as his captain Nguyen Van Quyet, also had opportunities to test Sou Yaty’s goalkeeping skills in the first half, but the wet grass prevented them from accurately finishing. Cambodia’s Coach Leonardo Vitorino said at the pre-match briefing that Vietnam were a stronger team but he hoped his players might create a minor shock at the My Dinh Stadium, after their 1-2 loss in the first leg match last month in Phnom Penh. However, they suffered an even greater defeat. The half-time break of over 10 minutes was not enough time for Vitorino to turn around his team’s fortunes, and Vietnam’s captain Quyet made the score 2-0 for the hosts around 10 minutes after the interval. Trung crafted a perfect pass into the box and Quyet finished with ease, with a header to the far corner of the goal. The 2015 Golden Ball winner Duc, who returned to the national team after several years of absence, marked his presence with Vietnam’s third goal in the 60th minute. With a move that again started with a pass from Trung, the ball found Duc inside the box and he finished into the net, his first goal for the national team in three years and seven months. Phuong finannly scored his first goal for the national team in the 76th minute, when the young striker left behind two Cambodian players before shooting into the net. Throughout 90 minutes of the match, Cambodia tried to launch their attacks but failed to threaten Vietnam’s goalkeeper Tuan Manh. By losing this match, Cambodia’s hopes of winning the Cup have ended, and they are now ranked third in the group with three points.